They’re only off by one number! And, when you get those two side by side, it’s easy to see why! 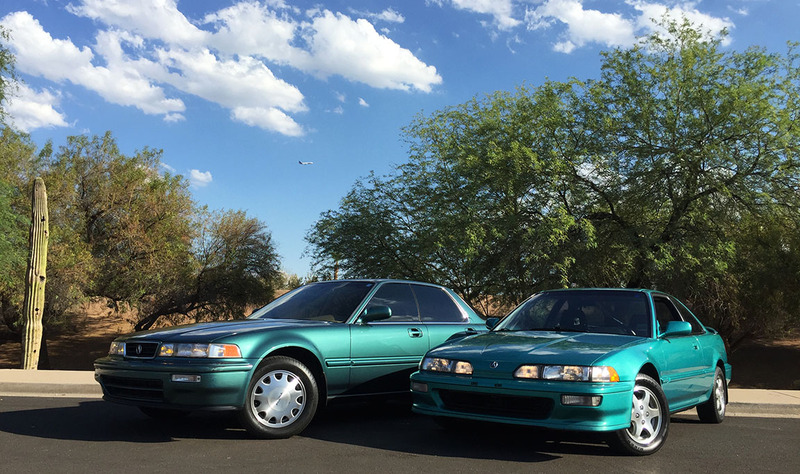 Teal green was such a 90’s thing, wasn’t it? I remember that even the home my parents built back in 1994 had teal green carpet in it. This is a picture of my youngest brother Payton, sometime in the mid-90’s. Not so sure about the look on his face, but who who ever thought it was a good idea to wash down scrambled eggs with Diet Coke? Bleh. Anyway, I sort of miss seeing green on the roadways. Maybe it’ll make a comeback? I decided to pull my two green machines out for a few photographs in the afternoon heat just for the sake of comparing the two shades. But first, a photo with Jack’s 2006 RSX which happened to be at my house at the time. Separated by 14 years! Integra is scheduled for new window tint on Tuesday. I’ll go with 20% like the Vigor has. I worked up a sweat running around to get these pics. Some wear & tear on on the front end here (consistent with 236k miles) and I’m trying to track down the “plugs” that cover up the holes where the license plate used to bolt in. The neighbors don’t care about me blocking the road. I’ve done it dozens of times before. I was asked a week or so ago by a loyal blog follower if I could provide an update on my “other” cars: The ones that reside on my rooftop. So, here are current pictures of the fleet of diecast 1:18 scale models that have been living on my chimney since around 2009. 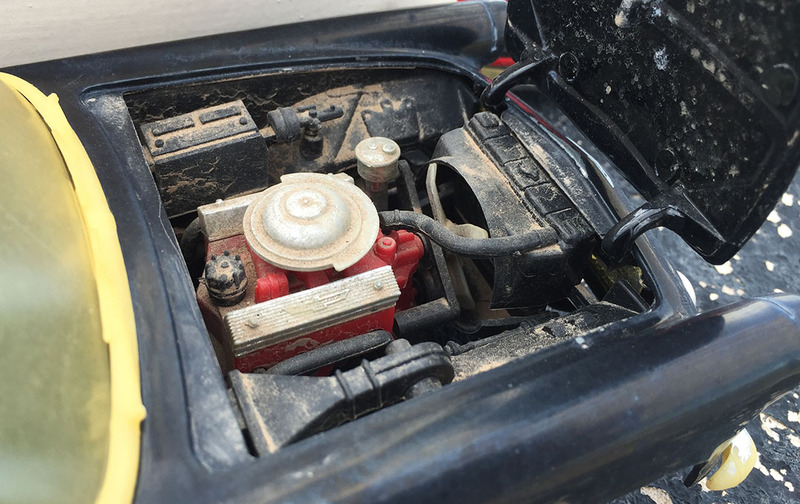 The purpose of this exercise, at least initially, was to regularly monitor the wear & tear that each vehicle experienced due to being exposed to the weather. I was good about taking photos every 6 months for a couple of years, but lately I forget the cars are even up there unless someone reminds me. As it turns out, Mother Nature hasn’t been too friendly to them. 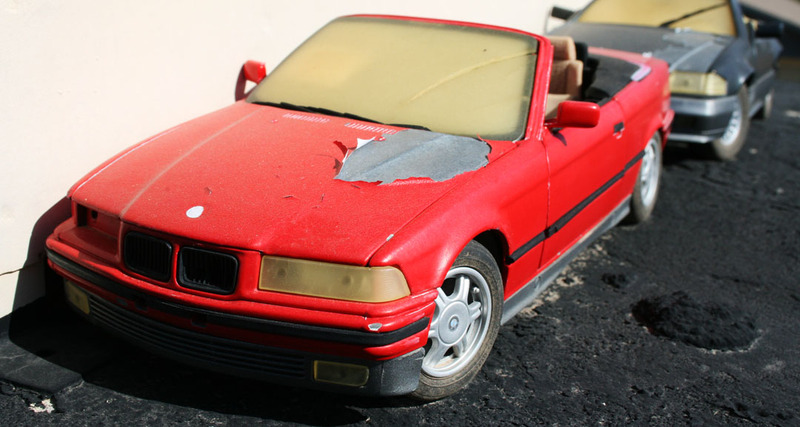 Take, for example, the current condition of my BMW 3-series convertible. 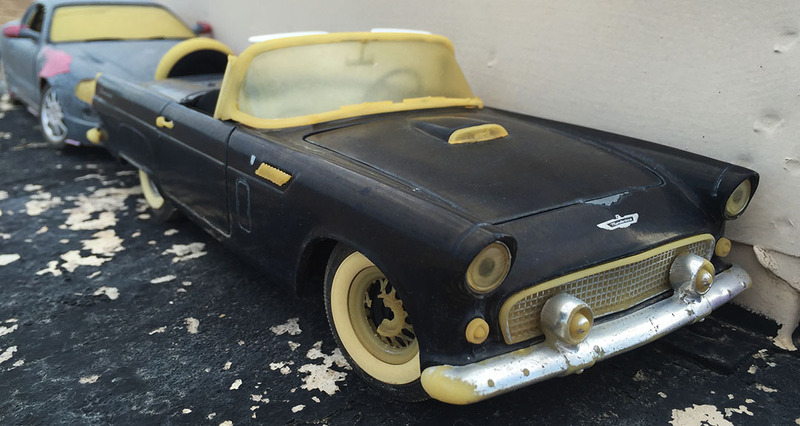 The car that’s weathered the (literal) storms the best has definitely been my black 1957 Ford Thunderbird. 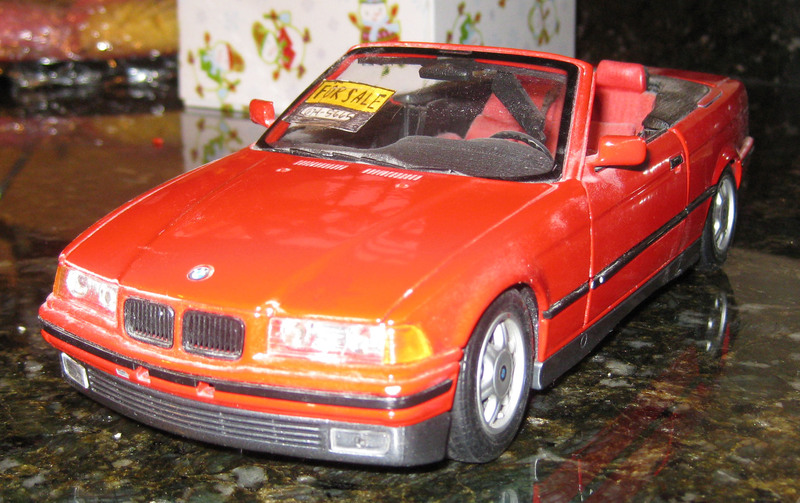 Aside from a little bit of chipping on the nose, the paint is all intact (though oxidized). And since this car is parked on the west-facing side of the chimney, it receives more daily Arizona sunlight than most of the others. 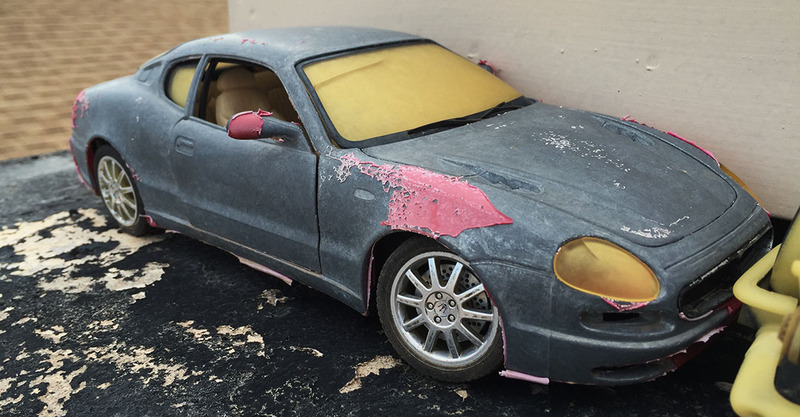 The plastics have discolored but I bet the paint would buff out with a wax job. Should I try some on the trunk? I think this is a 312-cubic-inch V8 motor. It might take some TLC to get it running again. The Maserati 3200GT was red at one time. Then it faded to pink, and now there is very little paint at all clinging to dear life. Sorry, but Italian build quality is not impressing me right now! 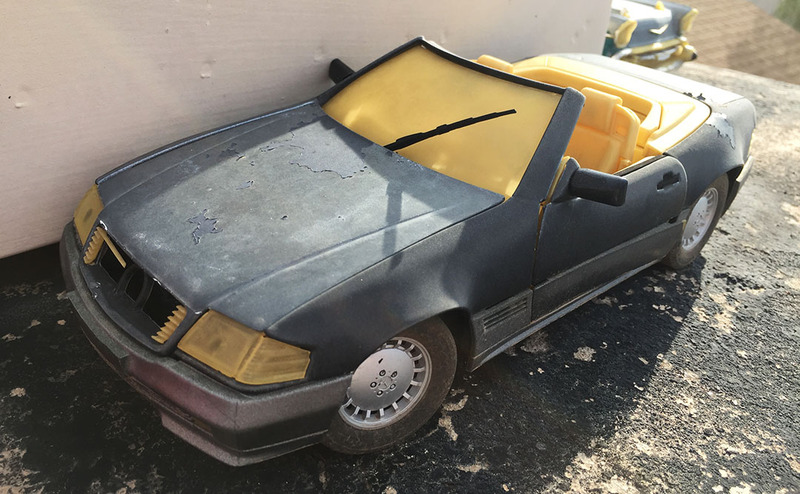 The Mercedes-Benz 500SL is looking pretty rough as well. The plastic grille slats have completely disintegrated. Here in Arizona we receive about 300 days of sunshine per year. So if this car’s been up there for 7 years, that’s 2,100 days of being beat on. 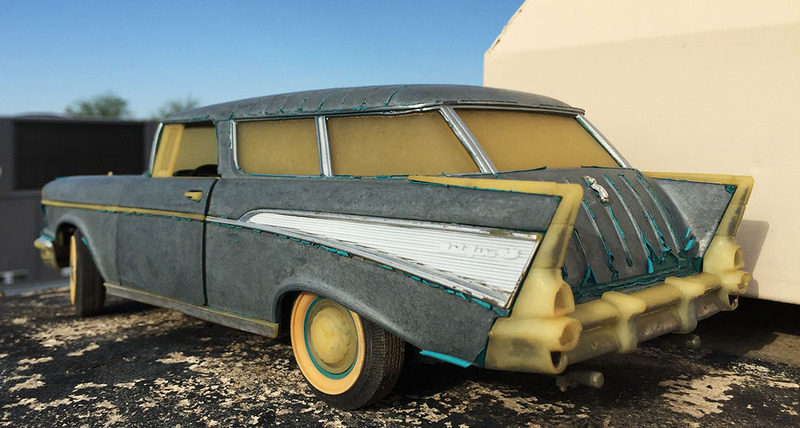 The Nomad is looking like a real restoration candidate. It was well kept in the beginning. 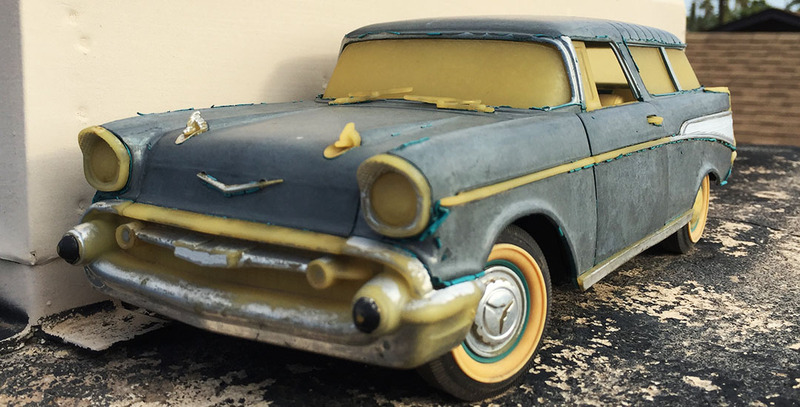 Someone needs to do a full restoration on this thing now. 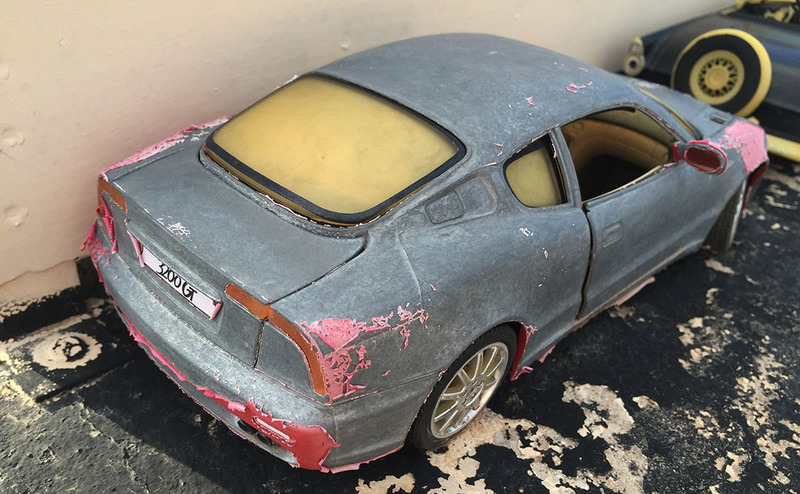 This entry was posted on July 2, 2016 at 6:32 pm and is filed under Integra, Model Cars, Vigor. You can follow any responses to this entry through the RSS 2.0 feed. You can leave a response, or trackback from your own site. Teal. 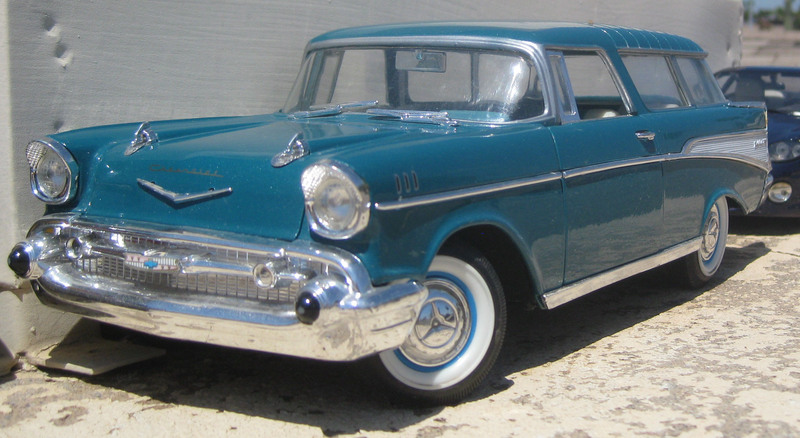 Everybody had teal cars back in the day. Remember garnet? That was another color everybody had to have. 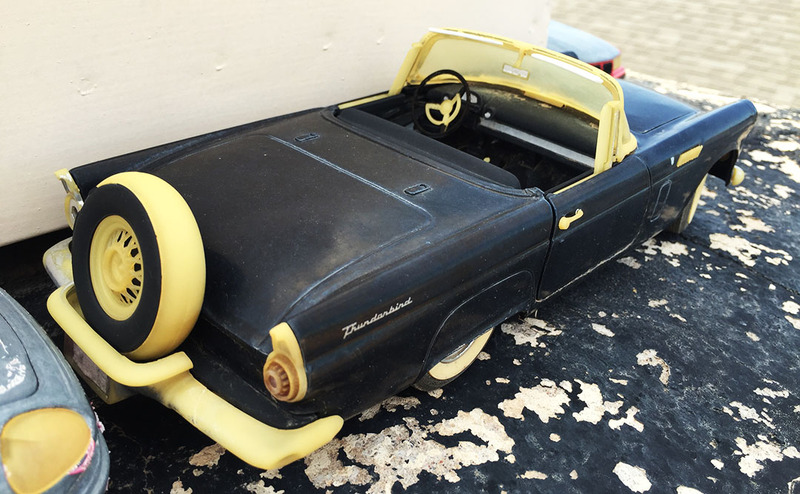 To have two cars with paint codes one digit off…. Priceless. Thanks Joe! Especially for the reminder that I needed to do provide a little update on this weird science experiment of mine. And yes, garnet… haha. Gotta love the 90’s. Hope you have a great rest of your holiday weekend! Second, how many vehicles do you have? Good luck taking care of that big collection of yours!!! Hey there, I’m not sure why the photos wouldn’t be loading but thanks for all the comments! And yes emerald green was a very popular one back in the late 90’s for sure. 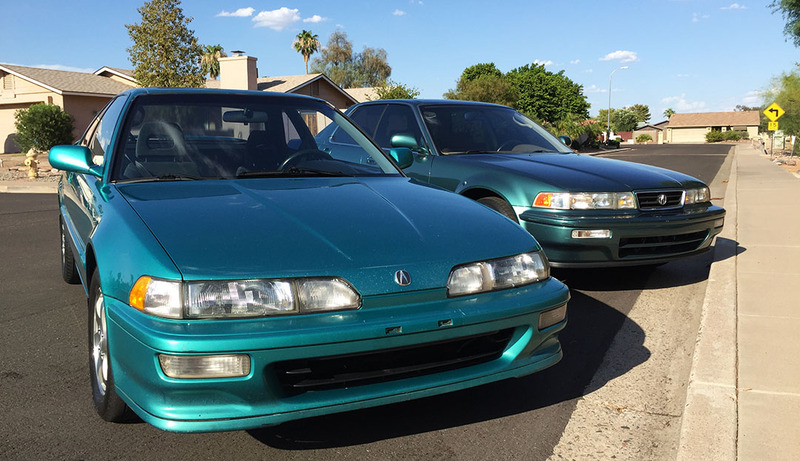 My mom’s first Legend, a 1993 L sedan, was Sherwood Green. Neat color – the pearl almost had a blue look to it in certain lighting. To answer your other question, I have 6 cars right now. 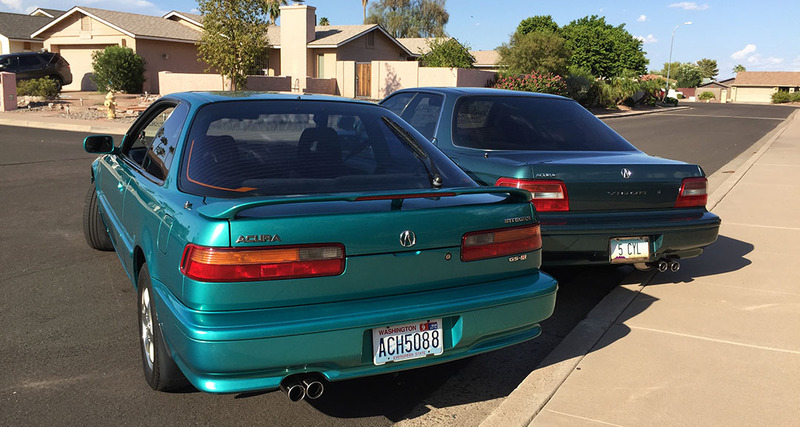 1992 NSX, 1992 Integra, 1994 Vigor, two 1994 Legends, and the 2013 ILX. 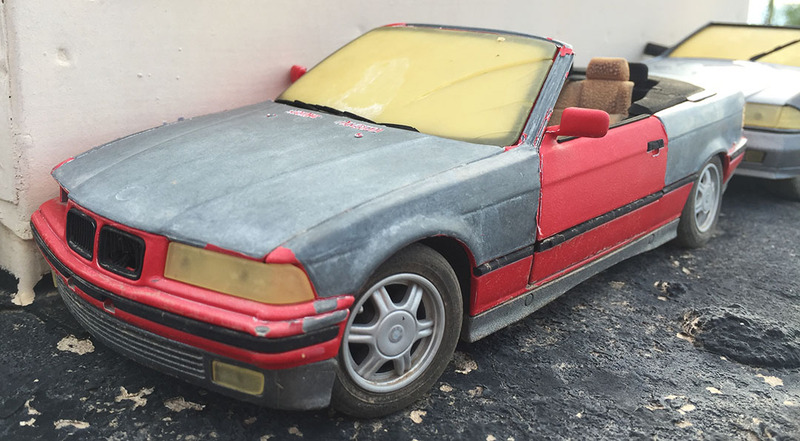 That BMWs paint, two years, it all came off that fast? How are those Vigors, they look quite nice? 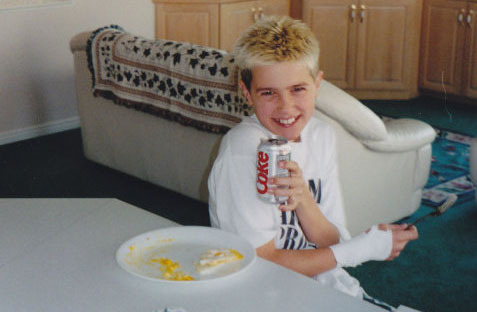 Your brothers hair… that carpet… and those cars! Oh my! Oh for sure. Let’s bring back bleached hair and green carpet! You’re in architecture, can’t you make at least one of those happen? That photo of Payton, though…. (I have no recollection of it, the whys or the whens, let alone the whats).